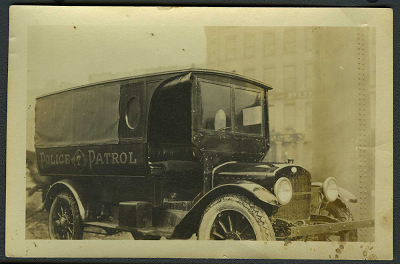 Vehicles like this one, from the 1920s, were called ‘paddy wagons.’ The meaning and origin of this nickname are not entirely known, but many theories exist. Photograph: Police vehicle, circa 1920. 2006.30.1. Two possible origins relate to early American prejudices about the Irish, who were often called ‘paddies,’ probably referring to the Irish name Pádraig or Patrick (also the name of the patron saint of Ireland). In the 19th and early 20th centuries, many Irish immigrants settled in the United States and began careers as policemen. By 1860, one in four New Yorkers—over 200,000—had been born in Ireland. Around that time, nearly half of New York City's law enforcement officers were also Irish. Therefore, a paddy wagon might have gotten its name because it was a vehicle often driven by an Irishman. However, paddy wagon may also describe a vehicle that carried several Irishmen, referencing the high number of Irish people arrested in those times. Looking back again to the 1860s, more than half of those arrested in New York City were Irish. Whether it originally referred to lawmen or lawbreakers, ‘paddy wagon’ is still a term for a police vehicle, usually a van, designed to accommodate a crowd of prisoners. So as you celebrate this St. Patrick’s Day, avoid the paddy wagon, mo chara. Today, we can recite from memory the warning law enforcement officers give suspects during an arrest, "you have the right to remain silent, anything you say or do may be used against you in a court of law..." You know the rest—whether from Law & Order marathons or personal experience (hopefully you were the police officer in that scenario). 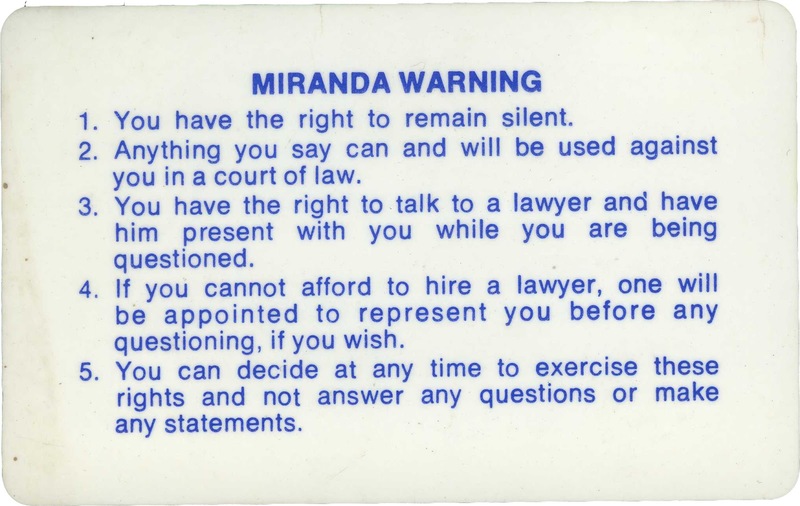 You probably know them as "Miranda rights," but have you ever wondered when and why this warning became part of the law? The arrest of Ernesto Miranda in Phoenix, on March 13, 1963—50 years ago today—emerged as a catalyst for change in law enforcement procedure. 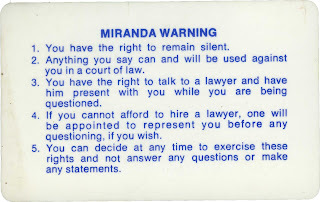 What are commonly known as "Miranda rights" were adopted into U.S. law following the 1966 Miranda v. Arizona Supreme Court decision, which found that the Fifth and Sixth Amendment rights of Ernesto Arturo Miranda had been violated during his arrest and trial. 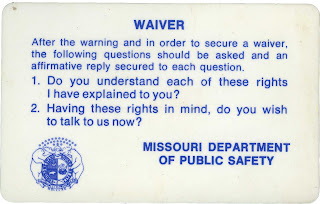 The court held that a defendant “must be warned prior to any questioning that he has the right to remain silent, that anything he says can be used against him in a court of law, that he has the right to the presence of an attorney, and that if he cannot afford an attorney one will be appointed for him prior to any questioning if he so desires,” as this laminated wallet card reminds officers. 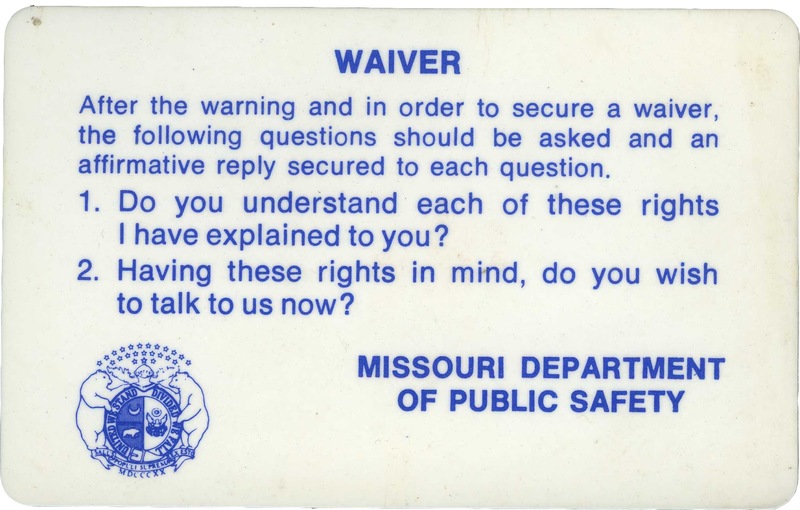 The card was donated to the National Law Enforcement Museum by Donald “Keith” Johnson, a retired Lieutenant with the Missouri Highway Patrol. Read more: Phoenix police mark 50 years since Miranda arrest (Associated Press via Policeone.com). It’s pretty much common knowledge these days (or at least it should be) that women play an integral role in enforcing the law around the country. Unfortunately, this has not always been the case. To think that even before women had the right to vote, they were taking up police positions all over the USA, is quite remarkable. However, there were a lot of people who found this idea—women as law enforcement officers—to be absolutely ridiculous. 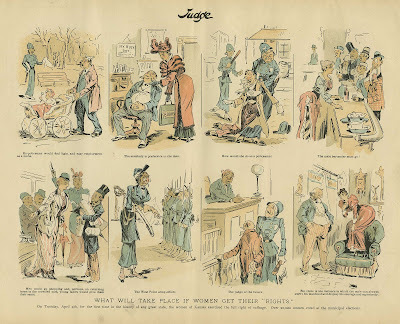 Check out this cartoon from an 1887 issue of Judge Magazine to see what other “crazy” things some people were afraid would happen if women got their rights. Thankfully, the skeptics were sorely mistaken, and women have the last laugh. 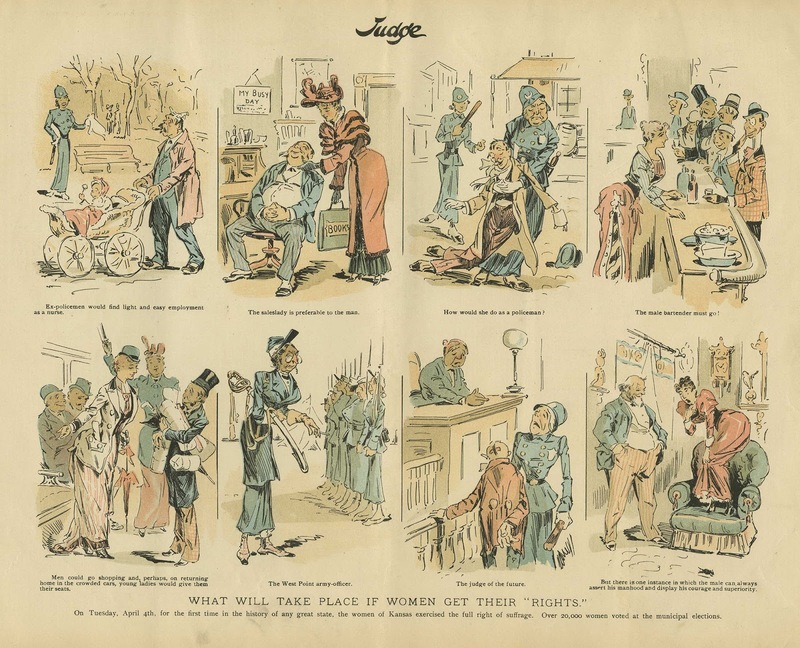 The cartoon was published in 1887 in response to women in Kansas being the first in the nation allowed to exercise suffrage in municipal elections. Kansan women were not, however, allowed to exercise full voting rights in federal elections until 1912. Kansas was the eighth state to pass this legislation, building up to the ratification of the 19th amendment in 1920 that granted all American women the right to vote.